Improving food access is a complex challenge, and a broad range of U.S. nonprofit organizations are working to create positive change. In an attempt to amplify the impact of a single organization, foun­dations have begun funding collaboratives of mul­tiple, high-achieving organizations. This three-year case study documents the successes, challenges, and recommendations of the funder-initiated but grantee-driven Nutrition Cohort. The Cohort, initiated and funded by a foundation, includes six nutrition-focused member organiza­tions, and was evaluated by a university partner (Tufts University). Study data from three annual waves of collection were triangulated using (1) key informant inter­views with Cohort members and Foundation staff, (2) a survey of Cohort members, and (3) review of documents about or created by Cohort organiza­tions. Over the study period the primary reported success of the Cohort was its commitment to work together as a “learning collaborative.” Crucial changes over the study period included enhanced trust and relationship building and promising shifts in perceptions surrounding the necessity of meet­ing attendance. This study also highlights additional benefits of the Cohort’s formation and growth across the three-year period, including organiza­tional capacity building, improved fundraising strategies, and enhanced community impact. 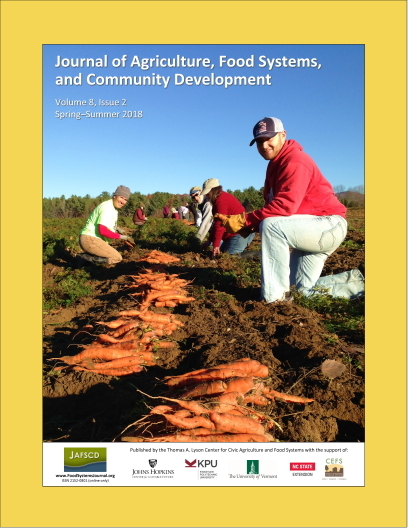 Study findings have implications for the practice of food systems development and may provide guidance for other foundations interested in starting similar collaboratives.